Julian Murray didn’t just love the law, he loved the law. To him, it was a living thing, and more importantly, a conduit to help other human beings. Murray (L’64), a prominent attorney and the co-founder of Tulane Law’s Trial Advocacy Program, was remembered by his dearest friends and family Jan. 30, in the institution that was his second home. 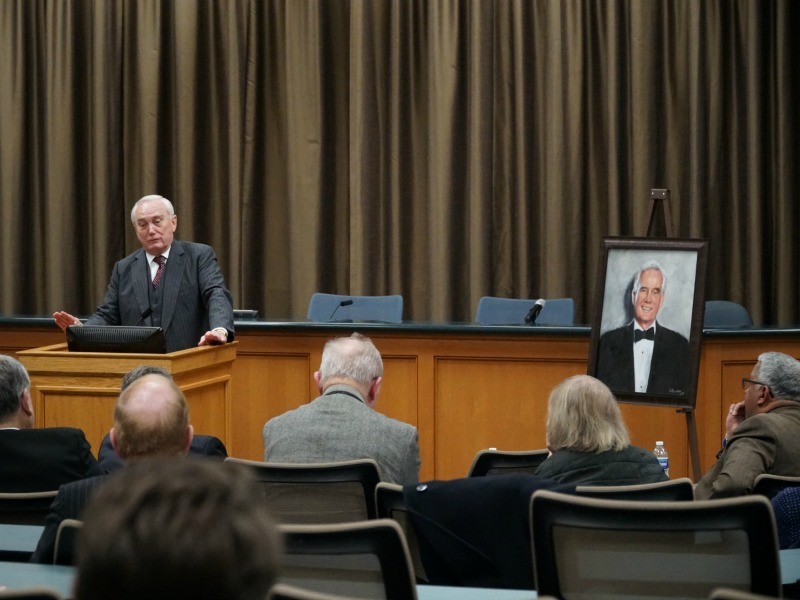 His work teaching hands-on courtroom skills, now threaded through almost every course in the law school, and his passion for helping others was the night’s theme. One by one, his family and friends remembered the man who once cried uncontrollably when he couldn’t save a client from death row, and who brought to the firm Christmas party the wife and children of a client so they could collect presents. They recalled the passionate orator, the wise mentor, the savvy attorney, the big brother, the friend and the booming tenor voice that would not be contained at a party. Stephen Murray (L’68) had his own tumultuous early college years, uncertain about what he wanted to do. It was Julian who put his credibility on the line and asked a dean to give his younger brother a chance. “I went from being on probation to the Dean’s List in one semester,” Stephen Murray said. It also was his brother who encouraged him to go on to law school. Stephen tried but after two years wondered if he wanted to continue. Lynn Luker (L’82), a former student of Murray’s who would go on to become the co-director of the Trial Advocacy Program, recalled that Murray “changed my life.” She didn’t like law school until she took trial advocacy. “And suddenly, I found something that I liked and was good at,” Luker said. By the time she finished law school, she had a job offer from a large law firm, which she credits to her time under Murray’s tutelage. Murray took cases no one wanted, and defended controversial clients, including an episcopal bishop who would go on to become a friend and counselor. Bishop Joe Doss was arrested in 1980 during the Mariel boatlift for smuggling more than 400 Cuban refugees in a 112-foot, WWII submarine chaser. The Cubans were relatives of those in his congregation. He hired Julian Murray to represent him. He remembered preparing closing arguments with him in a courtroom that showed immigrants arriving in America’s shores. He watched Julian practice, and begin to cry. Shawn Murray said a remembrance at Tulane would have meant more to his Dad than his most prized award, when the Louisiana Bar Foundation named him Lawyer of the Year. “He would have been deeply humbled by this,” Shawn Murray said.